The CamelBak ThermoBak 2.0L Hydration Backpack is a smaller, lighter version of their popular battlefield design. Made from ultra-durable 1000 denier Cordura nylon, it is built to endure. Closed-cell foam underneath keeps the reservoir insulated, and the drinking tube features a neoprene sleeve to preserve water temperature all the way to your mouth. 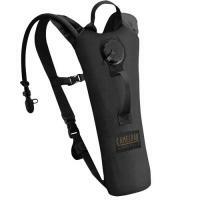 Ergonomic shoulder straps make it easy to carry, and they can be detached quickly using the quick-release buckles. The pack contains a Water Beast reservoir, complete with a Big Bite Valve and PureFlow tube to provide rapid hands-free access to fresh-tasting water. The screw cap allows refilling without removing it from the bag for convenience.